Mark Millar has had quite a renaissance in the last few years no matter how you slice it–just when most comic fans had written off his predictability and the always expected ultra-violence, he has begun to put out a wide variety of books that have appealed to many of his harshest critics. From the classic sci-fi of Starlight to the thoughtful superhero epic Jupter's Legacy, it's hard to argue that he's turned a corner and hit upon a new vein of creativity. 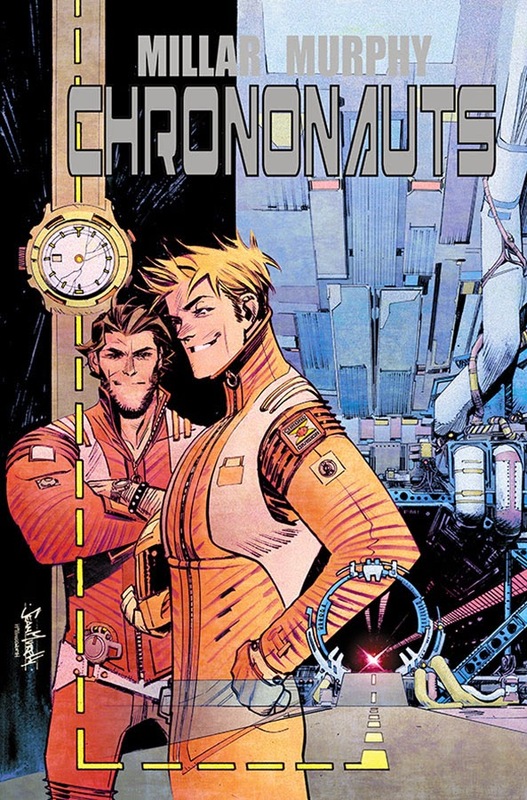 It also helps that he is able to work with some of the most talented artists in the business, from Frank Quitely to Dave Gibbons, and now he gets to add another name to that prestigious list in Sean Gordon Murphy, who he has partnered with on their newest Image book, Chrononauts. Since this doesn't come out for a couple weeks, I'll keep this spoiler free, but here's the gist: two scientists, Corbin Quinn and Danny Reilly, have been slowly working on time travel, particularly of the historical kind. In the beginning, they are able to send back satellites into the past, receiving footage of historical events which leaves the world in awe, but this is only the first step: next, they claim, is manned time travel into the past. Corbin goes first, but as in all good science fiction, something doesn't go perfectly as planned. It's a decent logline, but the setup in the first issue is actually pretty compelling. I've always admired Millar's creativity, but it was too often buried under layers of...well, Millar-ness. Here we get that unbridled and exceptional cleverness in the storytelling, little ideas that are unique but work perfectly as world and character-building pieces. For example, the story begins with Quinn exploring a middle eastern ruin only to find that a perfectly intact F-14 fighter jet entombed within. 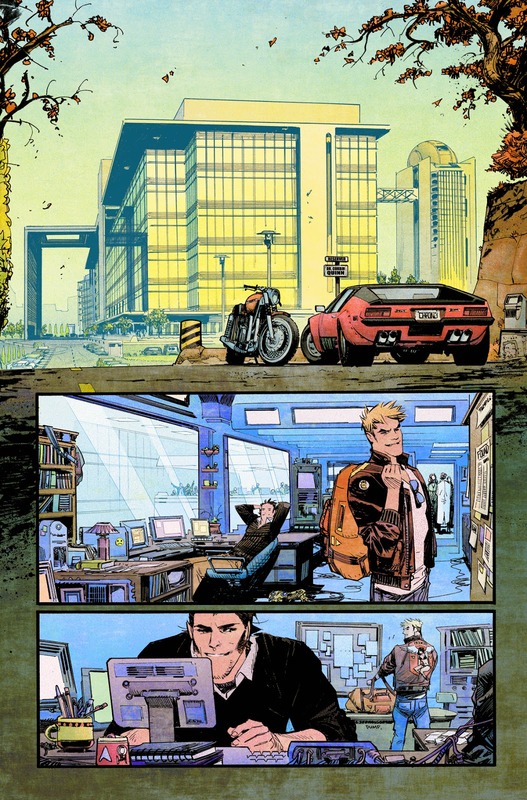 While this could have been the impetus for the entire story, it is instead only a confirmation–according to Quinn–that he is going to succeed in his time travel. This kind of bold bravado is key to the story here, too, as Quinn and Reilly have a sort of Top Gun-esque relationship. Much of the issue is dedicated to the buildup to their manned mission–more on that in a moment–but there's a surprising amount of character building here, too. We learn a bit about Quinn's trouble with past relationships while seeing that although Reilly is at times a frat-boy with a PhD, when Quinn is in trouble that layer begins to peel away. There's definitely more to dig into, but they've given us enough to get an idea of who they are and where they might go, and they fit into the molds of classic adventure movie characters in a way that's quite enjoyable. The storytelling by both creators is quite well done; the issue is paced interestingly as we jump forward in time in chunks as the team celebrates successful explorations back in time while the world watches with equal parts fascination and terror. Much of the pacing is owed to Murphy, who is at the top of his game here. Granted, Millar gives him a lot to work with, from detailed sci-fi machinery to several time periods that are explored, but its the effortlessness with which Murphy renders the personalities of these two characters with just body language and facial expressions that instantly gives the story a great deal more heft. Chrononauts has a clever start in its first issue, but it barely scratches the surface of where this story may go, and I'm not sure that's a good thing here. That's often the trouble with first issues: while we can get a fascinating introduction to the world and characters, the inevitable last page reveal can leave us in a place altogether different from all we've read (and enjoyed, in this case) up to that point. Although it probably wouldn't last long on the shelves, I can't help but wish the build up to their mission wasn't just the first issue–I've read enough stories of someone in a strange and hostile time period lately. 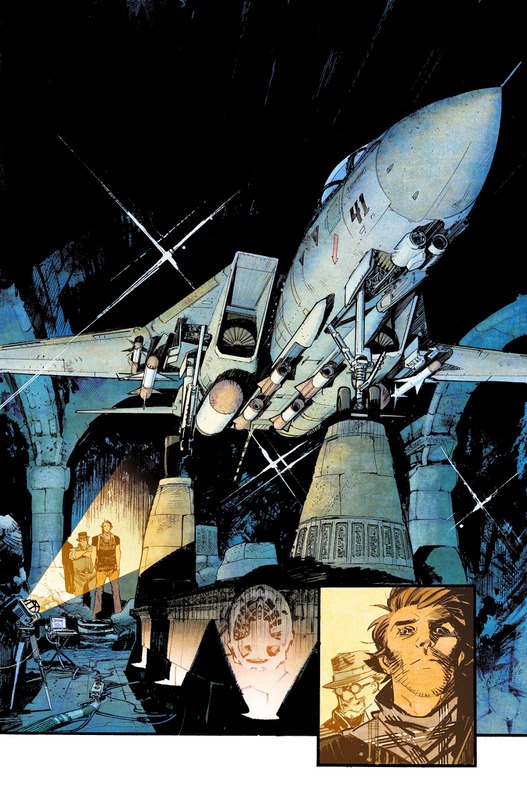 However, the rock star scientists with historical goals not unlike Indiana Jones that Millar and Murphy have introduced here are enough to warrant being interested in the next issue to see where it goes. 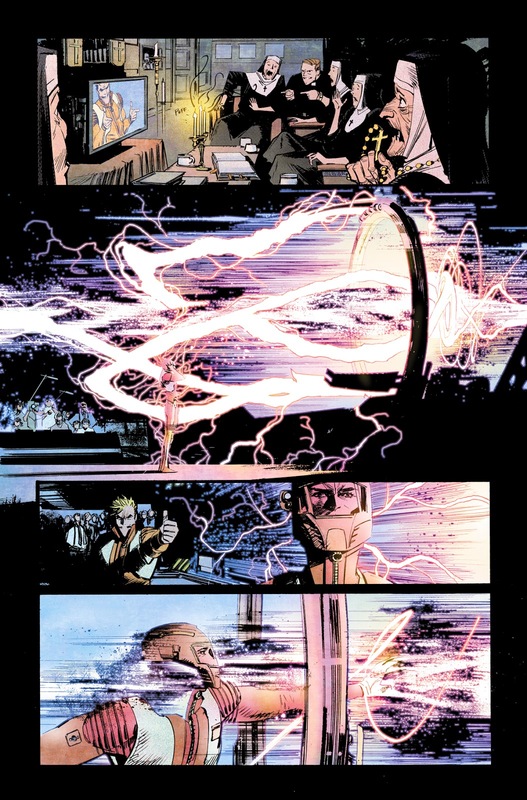 Chrononauts #1 hits shelves and Image Comics.com on March 18th.